Hidden in plain sight, plainly visible and yet invisible, like Ninja magic...this is the essence of the BattleScarf. Imagine being out with a few friends enjoying yourself in the winter time and knowing that in the blink of an eye you can transform your humble scarf into an effective improvised weapon that is capable of breaking cement patio blocks should you encounter an unexpected "surprise". Worn under a coat, you hardly notice the BattleScarf yet can access it instantly! That is the devastating power of the BattleScarf - "No joke, no lie!" as it's inventor Jason Gibbs of Milton Freewater, Oregon would say. Plus the BattleScarf looks good and is incredibly useful for a variety of everyday normal purposes as we shall discuss here. It's not a trick, but instead a versatile piece of wintertime gear that is 100% worth it just for the day-to-day civilian aspects, let alone it's self defense value. I have been evaluating one of the BattleScarves for several weeks now as I write this and the weather has been in the 20-35 degree range so I've worn it every day when I've gone out and even just around the house if it's a little cold because I hate to turn up the furnace. 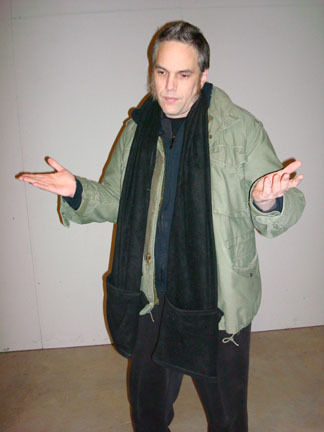 Physically the BattleScarf is 6-feet long and made of a warm, soft fleece material. It is double-stitched throughout for durability. The quality of both the material and workmanship is impressive. This is not some "loving hands at home" project but instead very professional looking and will fit in with your normal winter clothing. The scarf is cut so it can open up in the middle and act as a hood. Each end of the scarf has a large pocket on one side and an open hand warmer section on the other. As a scarf it is warm and comfortable. When you put up the hood or use it as a hood with face mask you'll be set for even cold, windy days - it works great. As an extra set of exterior pockets you'll find it perfect for your keys, loose change and so on when in a hurry. 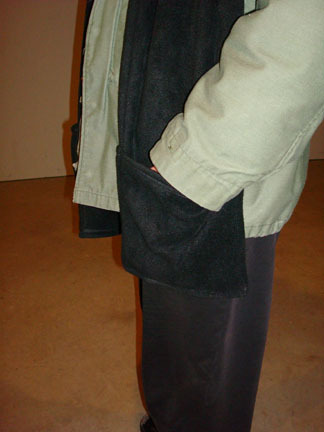 Even if you're wearing it under your coat, the ends are long enough to allow access to the pockets. Though you have to pay attention - since the pockets do not close it is possible for an object to slide out. The open ended hand warmers allow for use of your fingers which would allow for greater dexterity but I find myself preferring to just use the scarf's pockets as mittens when it comes to doing something like scraping the snow off my car's windshield if I don't have my gloves. 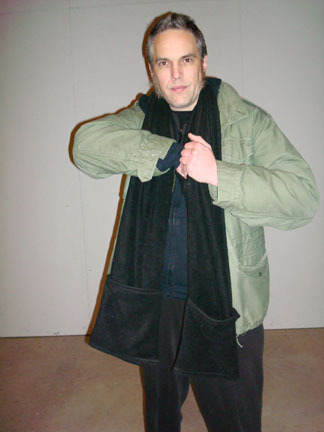 You can also use the BattleScarf like a money belt to conceal small items inside the body of the scarf itself. A drivers license, credit card and some cash could easily be carried this way if you wanted to go out without having to bring along a wallet, or as a way to protect your "real" valuables when you carry a dummy wallet. It's also great for magic tricks. If you've ever seen the old "hypnotized rope trick" or "Hindu rope trick" where the magician gets a rope to become rigid and stand up with no visible support, it's easy to do the same thing here. A very funny illusion and works like a charm. If you are a magician you will find that the BattleScarf suggests all sorts of other uses to you! When it comes to martial applications, the BattleScarf has a number of things that make it unique among flexible weapons. It's covert nature means that very few would ever recognize it for what it is. The very nature of a weaponized scarf is so outside-the-box that it is also unlikely to be perceived as a serious threat. Much like the fighting bandanna, people think it's a joke, like "What are you going to do to me with that?" They have no idea the power that a flexible weapon can deliver or the versatility of their use. 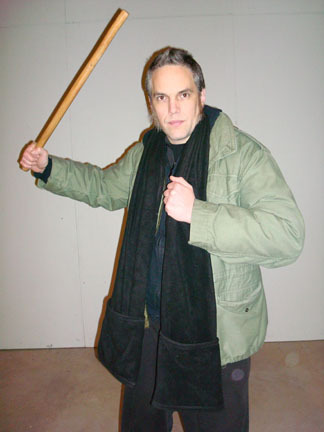 Now, even without using the scarf itself as a weapon, wearing it allows you covert access to the hidden pockets that may contain a more powerful tool, such as a knife, telescoping baton, or small pistol. From a position that looks like you're just standing or sitting there, you can easily reach into a pocket without raising any attention should you see trouble coming. There is no tell-tale sign of "I'm drawing a weapon now" like the lifting up of a shirt or the characteristic peeling-back actions of a coat for weak or strong side draws. 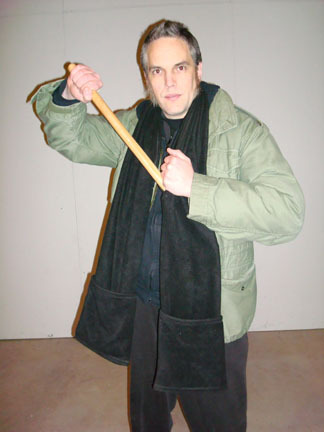 When it comes to direct combative techniques using the BattleScarf, there are many ways to employ it depending on the skill base and creativity of the individual. Typically these involve methods of Deflecting, Wrapping, and Striking. Inside of these three broad categories are many specific actions. These include single and double handed methods, swinging one or both ends weighted, grab releases, one-handed projections and two-handed recoveries similar to the Chinese chain whip, binding and tying techniques similar to Silat including a way to easily do the special sarong double wrist-warp that allows for all the specialized techniques from this position to be used. Practitioners already familiar with flexible weapons training such as seen in James Keating's Fighting Bandanna DVD series or in the Bandanna Quick Start Guide on Modern Knives #9 will feel right at home with the BattleScarf. On the DVD that is included for free with each BattleScarf, Mr. Gibbs presents a number of simple ideas and applications to consider as a starting platform. From there, he encourages each person who uses the BattleScarf to add their own "pepper and spice" to the equation make it unique and workable for them. In addition to the pockets, as mentioned before objects can be concealed inside the body of the scarf itself. In our tests, we found that Arnis sticks were very easy to load inside the scarf and carry there without arousing suspicion. You can draw the stick out to use it or strike with it still in the scarf. I did this to several people and no one noticed anything unusual until I lightly hit them with what appeared to be my scarf. Unless you know to look for it, it's actually a lot harder to spot then you would think. Try it for yourself with one of your buddies - the reaction is priceless! They get this look like WTF! Haw haw haw. If you hit with the stick in reverse grip it is even more subtle a set up. If you slide a stick into each end the BattleScarf it becomes an improvised 3-sectional staff and again, as long as you're careful how you move it can be very low profile. If you have an open coat covering the scarf it is not easy to detect the two concealed sticks! The sticks can also be drawn from the center opening while wearing the scarf if you want to use them alone. Now, I wouldn't walk around like this all day but it can be done as a ruse or way to go safely from place to place, say from your office to your car or something - a short distance, should you be in fear of your safety. Tell 'Em You Saw It Here At Alliance Martial Arts!